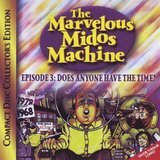 Growing up, the Marvelous Midos Machine was a family favorite – or shall I say, the second episode was a family favorite. We never heard any of the others, and I wonder if we even knew that there were any others. I’m sure we must have thought about what brought on Dizzy’s trip to outer space, and I know that we were curious to hear more about Dr. Midos and his time machine, but we only had the second CD (er, tape! ), and we were more than happy with it. As soon as my own kids were old enough to appreciate the Marvelous Midos Machine (MMM), I knew that I was going to need to get the full set – more for myself than for them. While the second episode is still my favorite, I really enjoyed listening to the full series. My children are now huge MMM fans, insisting that we can only listen to Dr. Middos. MMM #2 – Although my kids are petrified of the “nasty Dr. Doomshtein” (my big one tells my little one to cover her ears when “Dr. Doomshky” comes on – gotta love an overprotective big brother! ), I think we have all agreed that the second episode is our favorite. The songs on this album are top, all classics and all enjoyable. My favorite will always be the Nikayon song (“You gotta be neat, you gotta be clean, let Mommy take a break from her washing machine…”), with the Jealousy song a close second. And hey, at least my kids only want to name our next baby Shnooky; they haven’t asked about Shlumpy yet! 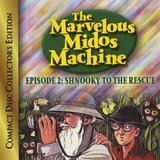 MMM#3 – Shnooky goes on an exciting adventure back in time, and somehow manages to teach good Midos along the way. I love that my children now know that George Washington was the first president of the United States – great piece of trivia to add to their repertoire! The songs are engaging, the highlighted midos are relevant, and turns out that Shnooky’s adventure was just a dream – or was it? I have not yet had the chance to listen to the newest episode, “Shnooky’s Bar Mitzvah,” and I have no doubt that this fourth chapter will be just as exciting and engaging as the others. 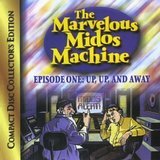 Up, up and away… It’s the absolutely Marvelous Midos Machine!